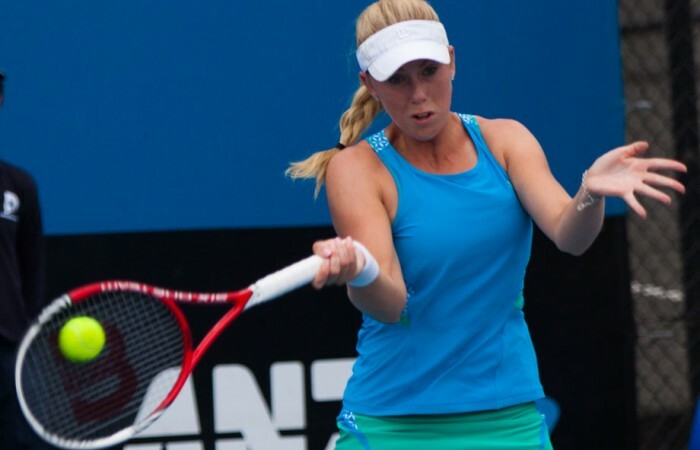 Victorian Tammi Patterson is through to the Australian Open 2013 Play-off semifinals after fending off resilient youngster Priscilla Hon in a rain-delayed encounter. Patterson battled erratic weather conditions, long delays and came back from a set down to post a 3-6 7-6 (5) 6-4 win against her 14-year-old opponent. Rain forced the match to be cancelled late on Thursday with Patterson trailing Hon 4-3 in the first set. The match resumed on Friday morning under the shelter of the indoor courts due to poor weather conditions. Hon gained the early advantage, winning the first three games to quickly close out the opening set 6-3. It was a much more evenly contested second set as both players engaged in long rallies from the back of the court. Hon posted a 6-5 lead but Patterson held serve to force the set to a tiebreak, which she won to level the match at a set apiece. The stage was set for an entertaining decider and the players did not disappoint. Hon won the first three games of the set on her way to a 4-1 lead, setting Patterson a difficult challenge. But Patterson responded in emphatic fashion, running her young opponent around the court to get the scores back to 4-4. Eventually it was the experienced Patterson who kept her cool as Hon made a flurry of errors largely due to fatigue. Hon had been impressive at the December Showdown this month, winning through to the semifinals of the girls’ 18s event and then winning her first Australian Open Play-off match against the more fancied Sally Peers. Meanwhile Patterson has spent most of 2012 away from the game, reassessing her future in the sport. Speaking after the match, the 22-year-old highlighted how important winning the Australian Open Play-off was to her. “I’ve had a lot of time off this year and I wasn’t expecting to get in here so once I got in I knew, I had to give it my best crack,” she said. Patterson attributed her inconsistent form to the long delay and the change of courts. “Coming from outside to inside is a bit tricky and she [Hon] likes the ball flat, hard and in her hitting spot so I think the indoors suited her. It was a bit tough but it was OK,” she said. Patterson has already defeated the number one seed in the play-off and will now take on third seed Monique Adamczak on Saturday for a spot in the final.